Lumpy porridge that won't set! I've tried rebatching this soap but it still won't set. I mixed them at 120 degrees, which I know is a bit hot but when I've done it cooler, it's sometimes not set very well. 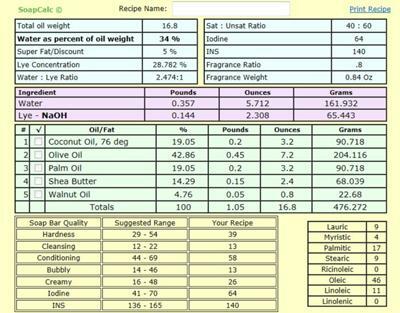 I ran your recipe through SoapCalc and it looks just fine. Too much water or too little sodium hydroxide are usually the reason a soap does not set up. Since your recipe is fine, the problem could have occured during the weighing out of the ingredients. You may want to confirm that your scale is calibrated properly and isn't weighing the ingredients incorrectly. Be aware that mixing at high temperatures can cause curdling and seperation of the soap batter. When making the soap be sure that you have brought the soap batter to a full trace before pouring it into the soap mold.